"Maybe everybody lies, all the time." Who is Polly? She's turned up in the small town of Bellville outside of Baltimore with only a suitcase and shoulders still freshly charred from the sun. She is staying in a dilapidated motel across from the equally ramshackle Hi-Ho bar. Naturally, the citizens of the small town are curious about who she is. Polly sits at the bar and announces to the man next to her, another out of towner, that Bellville is her new home. But why is she here and what has she left behind? Adam knows what Polly, Pauline as he knows her, is running from. He watched as she spend a final day on the beach with her husband and three-year-old daughter. His client tasked him with cozying up to the husband and getting to know the family. The goal was to uncover the money that Polly illicitly gained from his client. Things did not go as planned. Polly fled in the night leaving her family behind. Now as Adam sits next to her at this dive bar in the middle of nowhere, he has more questions than answers about the woman his is supposed to investigate. I've been a fan of Laura Lippman for years. Specifically, I've always admired her ability to craft stand-alone thrillers that draw me in and have unique characters. Even better, no two Lippman novels follow the same formula. In her latest novel Sunburn, Lippman presents a story that is so different from her others that I almost forgot which author I was reading. Even if my final reaction to the book was mixed, I have to applaud her effort in presenting something so unique. Set in the early 1990's Sunburn is a mystery in all aspects. We are left in the dark about Polly and her motivations for most of the novel. Lippman strategically reveals details about Polly's past with just enough regularity to keep the reader invested in the story and the suspense rolling. Setting the story at the end of the last century gives the novel a retro vibe that also helps to explain how Polly is able to conceal her history so well. Without prevalent smart phones, social media, and computers, it is not easy for Adam and his client to learn about their enigmatic target. My only real complain about Sunburn is that the ending was a bit too abrupt and tidy for the events that preceded it. 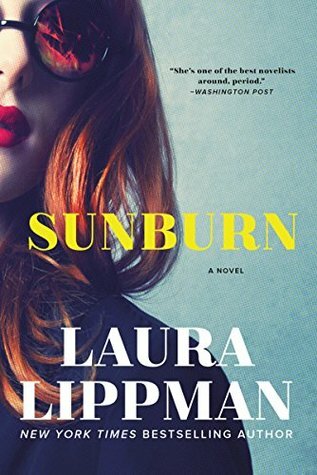 Still Sunburn is the perfect start to my early spring/summer reading and a solid reminder of Laura Lippman's writing prowess. This review is part of a TLC Book Tour. Click here for the entire tour schedule! This entry was posted on Thursday, March 8, 2018 and is filed under Book Review,Laura Lippman,Mystery,Summer Reading,Sunburn,Suspense,TLC Book Tours. You can follow any responses to this entry through the RSS 2.0. You can leave a response. I started this on audio and didn't slip in. Maybe I should revisit. It can be a bit difficult to find your rhythm with this one because we are left in the dark about the characters' true motivations for so long. Although it can be frustrating, when the author makes you wait so long to find something out, I think the payoff is so much bigger when you finally find out. The mystery and story structure sounds great, but I know the ending would irk me, because I have a thing about endings. Great review! I'm not certain the ending was worthy of all the buildup, but it was still a fun read! I have this one on hold at the library, picking it up tomorrow. Can't wait! I love when an author can continue to surprise me even after so many books. I really like the sound of each one of the stories being so unique to each other, and it never being the same even though it is by the same author. I am gonna have to check out her books! She has so many great books!